ProMedPills.com is an online Canadian pharmacy which claims to have been operating since 2002. They offer free bonus pills for everyone and discounted products. We look into the details of this pharmacy, finding problem after problem. Don’t shop at this drugstore before reading our conclusion. 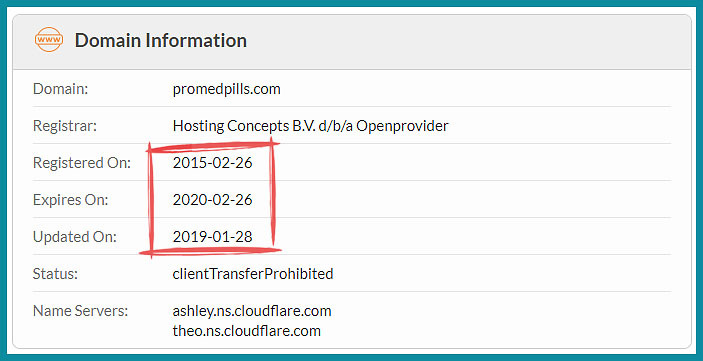 The Whois database shows that this domain name was registered in 2015 and a privacy service has been used to hide the real details of the owner. This business does claim to have been founded in 2002, with their website created in 2005. The database entry show this clearly isn’t true. This store’s main logo doesn’t match the domain name used. The reason that the logo is different from the address, is because this store has been uploaded to different web servers using many different domain names. This is a pattern often found with scam online pharmacies and is a very bad sign. It is good to find the contact address on this site, The business name seems to be ‘Canadian Pharmacy’, though we don’t believe this is a real legit business entity and it is not found in official Canadian Government databases. The address they provide is in Montreal, Canada and we can check this to see if it is a genuine business location. 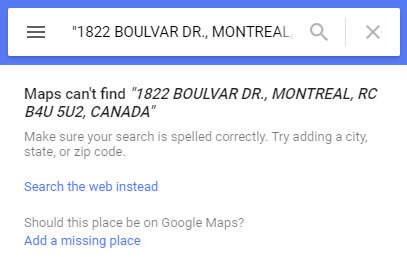 The results of the search reveal that this address doesn’t exist. The postal code and the street aren’t real and cannot be found. The use of, what is clearly a fake address, is a big problem which really condemns this pharmacy to the category of a scam. This online pharmacy has a number of regulatory seals. This is normally a great thing to discover and shows that the store is operating in accordance with the law. However, the seals on this site are entirely fake, created to convince you they are a trustworthy and legitimate pharmacy. You should be able to click on these seals to check that they are valid with the organizations in question. You can click on these seals but the popup window which is created doesn’t take you to the regulatory associations’ sites. The certificates you are shown are hosted on the pharmacy’s own server and are completely fake. When we click on the CIPA seal for the Canadian regulatory association, a certificate is displayed. The certificate says that Canadian Pharmacy is a member of this association. 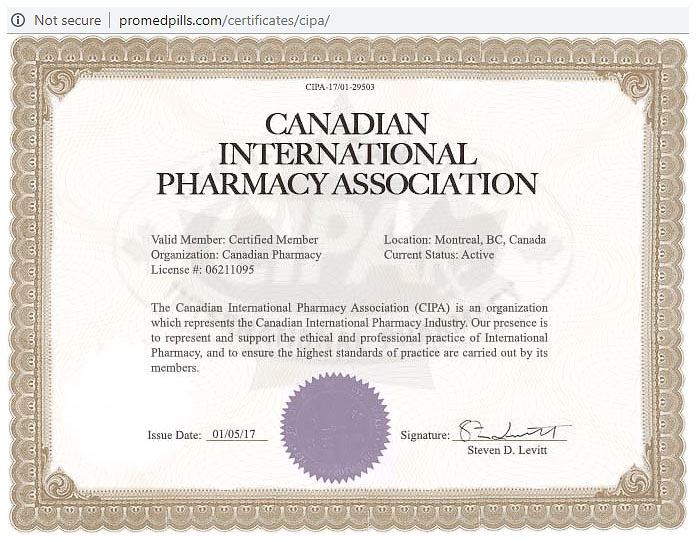 This pharmacy’s address is ProMedPills and not Canadian Pharmacy, so even though this is a fake certificate, they haven’t bothered to change the details to match the domain name they are using. A check on CIPA’s site shows that this pharmacy isn’t found in their database as expected. This store provides a fairly reasonable range of medications but is mainly focused on selling men’s health pills. This store says that their pills are manufactured and dispatched from India and the USA. Though we suspect that most will come from India rather than the US. They say that the manufacture of the pills is regulated by the FDA but provide no evidence to back this up or give us the name of the manufacturer. This lack of transparency and what we already know about this drugstore raises our fears that the pills being sold from this store could be fake or counterfeit. This store is selling many drugs which require prescriptions in most parts of the world. However, there is no mention of prescriptions being required anywhere on the site. This is what we normally find with scam drugstores, operating without any concern for patient’s health. We don’t have a coupon for this online pharmacy. This pharmacy’s checkout page isn’t secure and entering your financial data here could lead to your credit card details falling into the hands of criminals. But submitting your personal and financial data on this site could have long-lasting ramifications. Shipping is via airmail at a cost of $15 with delivery in 10 to 21 business days. For US customers, there is the additional option of express courier shipping. This will cost $25 and delivery is expected in 8 to 14 business days. Free shipping is available on larger orders. They add an extra charge of delivery insurance at the cost of $4.95, though they say they reship for free elsewhere on the site. 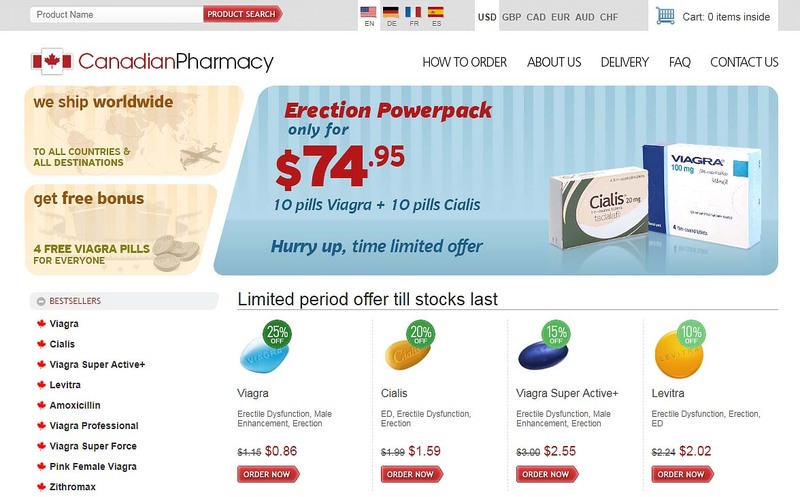 Free men’s health pills are offered on every order regardless of whether these drugs would be suitable for you or not. There is an online form if you have a complaint with this drugstore. Support is only available in English, which is strange given that they claim to be located in Montreal which has French as the official language. At least half of the people of the Canadian city speak French as a first language, yet support is only in English, it is almost as if they aren’t really based where they claim. Customer support is unlikely to provide you with a good experience if what we already know about the store is anything to go by. This store features a good number of ProMedPills.com reviews on the front page of their site. These testimonials are very positive and give great praise to various medications. What they don’t do is talk much about the service received from the pharmacy or mention them by name. Since we have found many fake problems with this drugstore, our suspicions are raised when it comes to these testimonials. The fact that they talk about medication rather than things like delivery suggests that they might have been copied from somewhere else. A search using a unique section of one of the testimonials shows that it is found on many other web pages. These testimonials are fake as expected. We have found many problems with this store. They are using a fake business name, fake address and fake regulatory and legal certificates. With all that is fake about this pharmacy, it won’t be a great surprise if the pills they are selling are also fake. Medication which isn’t genuine is a hazard to patients health and should be avoided. If all this wasn’t bad enough, the store’s checkout isn’t secure opening you up to fraud. We give this drugstore a rating of just 0.9 out of 5 stars. A risk to your health and wealth!